Friday, December 1st - WELCOME HOME JAMES!!! What a wonderful, and very emotional, day yesterday was! I am so thrilled that I had the opportunity to share such a special event with Rachael! I arrived at Rachael's house a little after 11am. She told me wanted to leave for the AHA (Alert Holding Area) at 11:15am. James' plane had landed at about 10:30 at Eielson, but it would take an hour or so before they got on buses and arrived here at Fort Wainwright. Parking was limited, and we didn't want to park too far away, so we decided to go early and get a spot. Besides... Rachael would have just paced a hole through her carpet anyway. We drove over and found two parking spots across the street. When we got inside, there was already a crowd gathering. I'm glad we left when we did. We ran into a few other wives we knew and chatted with each other. Everyone was smiling. The air was charged with such happiness! When we saw Steve coming towards us, we knew it was only a matter of minutes. By this time there were a lot more people in the building, so we moved to a position closer to the front line, so we could get a better view. An announcement was made that the bus was at the FRONT GATE!!!! Well, Rachael and I both started crying when we heard that. I think she even said at one point, "He's really coming!" Then, the huge garage doors at the end of the building started going up, and we could see the grills of the buses come into view. The whole building erupted in cheers and the band started playing God Bless America. The soldiers started filing off of the buses, with the lead soldier waving the 1-17 battalion colors. There was such a sense of excitement - both with the soldiers and the families. I remembered another reunion five months before, when my soldier came home. I will never forget the moment that those garage doors opened and I knew he was home! The soldiers dropped their bags and moved into formation. Steve ran out into the middle of the room, camera in hand! We were glad he was there because there is no way they would have let us get up close to the soldiers like he did! (That's Steve on the far left with the camera videotaping) He told me after I showed him this picture that the soldier on the right side of the photo - with the dark hat - is JAMES! He told James to take off his hat, so Rachael could recognize him. As the soldiers lined up before marching to the center of the building, I saw James waving and smiling at Rachael. I don't think she had seen him yet, so I turned to her and shouted, "THERE'S JAMES!!!" Rachael immediately burst into tears of joy, relief and love. I cried right along with her; so thankful that her soldier was home safely! It was such an amazing moment, and I was happy to be sharing it with my dear friend. The soldiers marched over to the center of the building so a short speech could be given. Everyone was scanning the group looking for their hero. Fortunately, the Colonel kept the speech short. It may have lasted 45 seconds at most, before "Dismissed" was called. And then there was chaos as people started running towards each other. Husbands and wives embraced. New daddies saw their babies for the first time. Fathers scooped up their children. Parents hugged their sons and daughters. Everything was a blur as people ran across the open floor. I saw James running from about 20 yards away. He and Rachael were heading towards each other, but couldn't see each other because their line of vision was blocked by other running families. I was off to the side and saw when the crowd opened up and they saw each other. Only a few steps later, and Rachael was in James' arms. The deployment is over for them! We still have several more planeloads of soldiers coming in over the next several days. But soon, all of our Stryker Brigade soldiers will be home. The community, and Fort Wainwright, is in a very celebratory mood - with 'welcome home' festivities scheduled throughout the month of December. I met up with Shawna and her children at the AHA too. The three of them were dressed in camouflage to celebrate the special day. If you've been reading my journal for awhile, you've seen photographs of Courtney and Collin - her adorable children. Here are a few photographs depicting their exciting day. Welcome Home, Jay! The past few days have been very busy for Steve. He's gone down to Eielson to meet every plane of Stryker soldiers. I think the last one came in today. If so, that means all of our soldiers are home except for the 'trail party' - who stay later to tie up loose ends. They should be home by mid December. It's nice to have our troops back. The community is much more lively. The restaurants are packed with tables full of families enjoying a meal out. The commissary and PX are busy for the holiday season, but also because there are a lot of soldiers home with disposable income. It is so wonderful to see 'army bald' men everywhere; holding hands with their children, with their arms around their wives, or laughing with their friends. I smiled at a young soldier behind me in line at Walmart. He was pushing a cart with a 3' Christmas tree in it. I bet he's thrilled to be celebrating Christmas here on American soil this year. It's so good to have them home! The days are getting shorter as we approach December 21st and winter solstice. Now, if I'm out running errands, I get to see a sunrise and sunset within a few hours of each other. While the darkness can sometimes be depressing, I get great joy in seeing the sky painted in bright shades of orange and yellow. The other day I met Steve for lunch, and as I was leaving the restaurant, I saw the most glorious sunset. Huge billowy clouds were rolling in, but they were uplit with bright orange. It was one of those moments when I was glad I brought my camera out with me. I decided to cut through Fort Wainwright on the way home, and drove past the ski hill, so I could pull over and take some photos without holding up traffic. I continued onward to the one lane bridge and the golf course, for some additional photos.The photos here were taken between 2:30 and 3:00pm. We're having quite a few issues here at the house with satellite TV. We have Dish Network through ACS, and the technicians have been out three times (and will be out on Saturday to run new cable). The problem is that the only way to get any kind of credit for lost service is to go through Dish Network themselves. It's such a mess and extremely frustrating. The service is costing us $55/month, and we don't have a signal 75% of the time. Unfortunately - unless we swear off television - there are no other options where we live now. We have 90 days to decide if we're going to stay with Dish or not. If the techs can't fix it this time, we're going to have them take the dish away. It's not worth the aggravation or the money. Then, this morning, I woke up to find that my DSL line is down too. What else could go wrong? First no television; now no internet. I think someone is trying to tell us that we don't need the conveniences of the modern world. Because of this, I'm not sure when I'll get this entry uploaded to my site. Steve's birthday is on Friday. He'll be 52 years old. It's hard to believe how quickly time passes! I asked him what he wanted for his birthday, and he said he wanted a snow blower. Why is it that men (maybe just my man?) choose really expensive 'toys' for gifts? It is now Saturday, December 9th. Yesterday, a technician from ACS gave us the phone number to get a dial-up internet connection as a temporary fix. They still don't know what's wrong with our DSL. Our phones work just fine, so I don't understand it either. It has been several weeks of frustration for both of us. The satellite TV is still down, and every time the technicians come out from ACS, they get it up for one day and then it fails again. It takes a week or more to get them back out here. They are due to come out here in an hour. Personally, I don't think they know what they're doing. ACS just got into the Dish Network business, and it seems that these techs must have gotten a crash course in how to set the system up. It's especially frustrating when they stand on your roof and say, "I don't know why this isn't working". We're between a rock and a hard place. If we go outside of ACS for a technician, we have to pay for the service call. On top of all this, any hope for credits or refunds has to go directly through Dish Network (an entity in the Lower 48), who has no idea what we're going through up here. I wish the customer service reps at Dish Network had a dialog with the techs here, but I doubt it. If they did, they'd see first hand that we've been without service almost consistently since day one. The living room is finally as put together as it's going to get. I even put the Christmas tree up. Now the dining room looks like a bomb blew up in there, but slowly that will come around too. I just hope it's in time for Christmas. We don't have any formal plans for Christmas. Now that our soldiers are home, most have opted for a quiet holiday at home with their families, or are going 'home' to their extended family. Understandable after more than 15 months deployed! Every year I have a problem with the 'blues', but it seems a lot worse this year. I'm thankful for a husband who does his best to comfort me, even when it doesn't seem to work very well. This has been one heck of a year for me, with so many changes and so much sadness and stress. I suppose these plummeting spirits are to be expected. It doesn't mean I have to like it though. We're almost at our shortest day of the year, and the darkness isn't helping either. Last year, around this time, I was preparing for my trip to Madison, WI to see my sons and my daughter-in-love. Spending time with them was such a mood lifter. And it got me out of dark Fairbanks for a couple of weeks too. I miss my family. The weather here has been unseasonably warm, while we watch the arctic winds and temperatures take over the Lower 48. It hasn't snowed in a long time - just a few flurries about a week ago. I love when it snows, but I also don't want to wish a blizzard on us with 3 feet of accumulation. I'm also not anxious to see -40F on the thermometer anytime soon, but I have a feeling we're going to see some bad weather later this month or in January. I suppose we should just enjoy this while we have it. At least it's keeping our fuel oil consumption down. Here are some more photos from around the house, and various other things I've shot over the past week. The first photo is of the bird feeder my friend Kathy sent me as a housewarming gift. Steve added a suet feeder to the tree a few days later. I haven't seen any activity around either lately, but I think the squirrels are helping themselves since there are seeds spread all over the ground beneath it. Friday, December 15th - My Awesome Soldier! It's been a great week, and for this I am thankful. My winter blues took a short hiatus for a few days, leaving me feeling much more cheerful and energetic. I've accomplished a little more around the house (will I ever be totally through with unpacking and finding places for everything? ), and Steve has been able to get home a little earlier in the evening, and managed to have most of last weekend off. I have really missed having my husband around on the weekends, but I know that he was needed much more by all of our returning soldiers. This past Sunday, Steve and I accompanied Rachael and James to Pikes Landing for their Champagne Brunch. It was absolutely wonderful - just as we remember from the last time we all went (in the summer, in a little boat down the Chena River). We ate our fill of breakfast foods, salmon, ham, roast beef, crepes, desserts, and more than a little champagne. Thank goodness for our designated drivers (Steve and James), because Rachael and I truly got our money's worth in champagne alone. As an added surprise, the Trujillo's picked up our tab in honor of our birthdays. We planned to pick up the tab in honor of James' return from Iraq, so we're going to have to go back again to do that. We're looking forward to it. On Wednesday evening, Steve and I attended a Hail and Farewell for Sr. NCOs (non-commissioned officers) and Officers. It was held at Pikes Waterfront Hotel, in a beautifully decorated room. The mode of dress was Alaska Casual, which means that jeans and sweaters, flannel shirts, etc. were acceptable. We love Alaska Casual dress mandates! Hail and Farewell events are held so that outgoing personnel can be presented with awards or plaques commemorating the service they've done for the company. Since Steve is retiring next year, we thought that perhaps he'd be receiving a going away plaque for his time as the 1SG. The Colonel called up two LTCs and Steve to receive awards. What a huge surprise it was for all three to be awarded the Holy Medal of Saint Maurice! This was totally unexpected, and was such a heart-felt moment for both Steve and I. To see the surprise in his eyes, followed by deep emotion, is something I will remember forever. I am so proud of Steve for all of his hard work and dedication to his soldiers. He is not only a loving husband, but a caring and committed leader too. Maurice was Primicerius of the Theban Legion. In 287 AD, the Theban Legion marched in service of the Roman Empire fighting against the revolt of the Berguadae Gauls. The legion was composed entirely of Christians recruited from Upper Egypt, near the Valley of Kings. The legion was ordered to perform service under Augustus Maximian Hercules. Maurice led the legion through Egypt, across the Mediterranean, through Italy, and over the Alps. The legion was ordered to offer pagan sacrifices, to the Gods of Rome, before battle near the river Rhone-at-Martigny. The Theban Legion refused to participate and withdrew to the town of Agaunum (Saint Maruice-en-Valais), also refusing to kill innocent civilians in the conduct of duty. Enraged, Maximian ordered every tenth legionnaire decimated. A second time Maximian ordered the Legion to participate in pagan rites. Again they refused to participate. Maximian ordered a second group decimated. Maurice declared his earnest desire to obey every other order lawful in the eyes of God. It is said he replied: "We have seen our comrades killed," followed by, "Rather than sorrow, we rejoice at the honor done to them." At this time Maximian ordered the total butchery of the Theban Legion, and the martyrdom of Saint Maurice. He provided loyal service to Rome. For his courage, commitment, and his strength of conviction, he was declared a Saint by the Catholic Church, and designated as the protector and Patron Saint of weavers, dyers, sword-smiths, and Infantry Soldiers. Yesterday was my birthday. I turned 47 years old. I am not ashamed to tell my age, as I believe that age is just a number and doesn't define who you are as a person. I saw a cute quotation about birthdays: "A birthday is just the first day of another 365-day journey around the sun. Enjoy the trip!" I certainly plan to do just that! I am thankful to have good health, loving friends, caring family, and a wonderful life mate at my side. The photo at left was taken on my 3rd birthday. I think I look much happier at turning 47 then I did turning 3! And I even had two cakes back then. I suppose I should blame Mom and those double cakes for the pudgy thighs I've had my whole life! It's a good thing she didn't bake us a cake for every year of our age, or I'd be in serious trouble. It was a quiet day for me, which is OK. Steve came home at lunchtime and took me out to The Pagoda for some Chinese food. As always, it was delicious. Then he was sweet enough to take me to the North Pole post office to mail off some more cards and packages, and didn't even complain when he had to wait 35 minutes for me to get through the line. Unfortunately, he had to go back to work for the afternoon, but when he came home last night he made dinner, poured me a glass of wine, and gave me a terrific foot massage. It was a quiet evening at home with my favorite guy; exactly what I wanted and needed. I love this time of year because of all the goodies I find in my mailbox. I've been getting cards from a lot of friends and family over the last two weeks. I strung a ribbon on a wall, and I hang them from there so I can enjoy them during the holiday season. My friend Kerry sent me a cute moose nightlight for the guest bathroom. He's dressed as Santa, and casts a red glow in the room. So cute! He goes wonderfully with my moose decor. I found a 'wildlife' shower curtain for that bathroom, and hung two of my moose prints in there. Both photos were taken at Denali National Park just before the park closed for the season in mid September. Speaking of moose, I haven't seen too many lately. I know they're around because I find nibbled branches in my yard, and there was even a small sapling down across our driveway the other morning. The little branches had been chewed off. There are times that I open the door to let Sedona out (at night), and she looks off into the trees and begins to growl and make gruff sounds under her breath. You have to be careful when driving at night here. Especially now that nightfall is so early. I've seen moose dart across the road seemingly out of nowhere. If you're not vigilant, you could end up with a huge hood ornament and a totaled car. The moose photo above was taken the night before last, on the way home from the awards ceremony. Fortunately, she was content to stay on the side of the road. When I took the photo, the flash spooked her and she went running off into the trees. I'm glad. I'd hate to see her get hit, and I'd hate to see people get hurt too. My dear friend Michele (we grew up together in Philadelphia), and husband James, sent Steve and I the 2006 White House Ornament. This is the 9th ornament in our collection! (Thank you very much!!!!) It is always such a thrill to find it in our mailbox. Also included with the ornament was a lovely Christmas card photo of their beautiful daughters, Maddie and Josie. It's always so surprising - and bittersweet - to watch my friends' children grow up so quickly. Where does the time go? My DSL is working again too. Thank goodness! Dial up was driving me crazy. I don't know how we survived with Dial up for all those years. We didn't get fast internet until we came here to Alaska. Until then, I thought Dial up was just fine. I know I should be thankful that fast internet is even available where we live. Many folks in AK don't have any internet service at all. I'm so addicted to it; it's my main contact to family and friends! It's hard to believe that Christmas is only 10 days away. While it will be a quiet Christmas at our home, it will also be a very special one. I am so thankful to have my husband home safe and sound, where we can hold each other and take advantage of the mistletoe sprinkled throughout the house (he's a sneaky guy! ), rather than share holiday greetings via web cam or telephone. Likewise, I am happy for all of my friends who have their soldiers home too. Please keep those troops who are not spending the holidays at home in your thoughts and prayers, and never forget those who made the ultimate sacrifice by giving their lives for our country. This past weekend (including today) has been wonderful for Steve and I. It's the first weekend in almost a month that he's actually had the entire weekend off. He's also taking today off, and we plan to just chill out and do nothing. Right now, he's out running last minute errands for me; standing in the dreaded line at the Post Office, to get some more cards and small packages in the mail. I'll be glad when the Christmas rush is over. We spent Saturday unpacking some more boxes and getting the dining room in some semblance of order. At least the table is now cleared off and we can actually host dinner here. I still have some of my photos stacked against the wall for placement throughout the house, but I've hung those I wanted in that room. Someday I'd like to get a new dining room table and chairs, but it's not a priority. What we have is quite sufficient. On Sunday, we were up early and eating ham and swiss cheese omelets with bagels and cream cheese. Steve is the absolute best breakfast chef in the world! I love weekend breakfasts when he cooks for us. What a delicious way to start the day. We packed up the emergency box for the truck (sleeping bags, water, candles, matches, extra clothes and outer gear, crackers, etc. ), loaded up my camera gear, and took off for Chena Hot Springs Resort - about 60 miles away. We were both in need of a quiet scenic drive, after weeks of getting settled in and military homecoming events. The emergency box is a must when you go off driving here in Alaska. Chena Hot Springs Road, while not desolate, winds through miles of wilderness about 25 miles down the road. Except for a few homes here and there, and the occasional campground, you're basically on your own. Length of day is now less than 4 hours, however there is visible daylight for about 6 hours with the period of dawn and dusk before and after the sun rises and sets. Believe me - it passes quickly. Sometimes it seems like I'm just getting started on my day when the sun starts moving back down again. Thank goodness, we only have a few more days and we'll be gaining daylight. We had a peaceful drive; keeping our eyes open for moose along the way. The road had some slick areas in places, so we couldn't even maintain the speed limit - which is perfectly fine with me. I prefer a leisurely drive, slow enough so that I can enjoy the passing scenery. The road goes over various sloughs and forks of the Chena River. For the most part, the waterways are frozen, however there are some areas where the current is running swift and still carves a thin opening in the ice and snow. One of my favorite places to stop for photographs is the Tors Trail State Campground at about mile 45. When we arrived at Chena Hot Springs Resort, we decided to have lunch before heading back home. The food is expensive, but the restaurant has nice ambience with its log walls and wood trim. We opted for burgers, and although I ordered mine well-done, it didn't arrive that way. They cooked me another one, but because I had to wait an extra 30 minutes for my meal after Steve was served, the manager comped my meal. We didn't even complain about the mix-up, but she took care of us anyway. Very nice! There weren't too many people swimming in the hot springs. It was cold, so Steve and I only did a short lap around the premises so I could take a few photos. I love the way the frost forms on the trees there. The warm steam coming off the hot springs freezes on the trees and branches almost immediately, making them thick with hoarfrost. It truly looks like a landscape out of some far off arctic fantasy land. On the way home, we watched the sun dip below the hills in front of us. A beautiful band of orange stretched just above the hills, as the sky turned a deeper and deeper blue. We didn't see any moose, but we did drive by a musher/handler training his sled dogs for the upcoming race season. The photo is blurry because I took it from the moving truck (and past Steve and out his window), but I wanted you to see that the team is pulling a four-wheeler. When the snow isn't deep enough for a sled, four-wheelers are a good alternative. A four-wheeler is a four-wheel all-terrain vehicle that weighs about 500 pounds and has an engine that can be used to regulate how fast the dogs run and how hard they pull. Good training! The other day, my eldest son Chris called me to let me know that he had received the box I sent him. This wasn't a box of Christmas gifts. Instead, it was a box of old Christmas ornaments from his and his brother's childhood. When the boys were little, I removed all glass ornaments from the tree, since they were quite fond of playing with whatever they could reach, and were also not the most careful when riding their little pedal toys in the house. In the place of the glass balls, I hand sewed about two dozen stuffed ornaments. There were angels and Santas and reindeer and carolers, etc. I also made candy canes and snowflakes out of wire and beads. And there were a few painted wooden ornaments. After moving into this house, we discovered that the packers had unpacked my 'old ornaments' boxes and repacked them - combining them with the ornaments I currently use on my tree. It was time to do the sorting I had put off for years. I gathered up all of those stuffed ornaments, along with some of the early ornaments my kids made me in school (their picture on a margarine lid with glitter and painted elbow macaroni), pipe cleaner reindeer, and wooden spool drums, etc. I placed everything in a box and addressed it to Chris. While going through the boxes, I also came across a manger set-up that the boys and I had made about 20 years ago. It was a plaster of paris project, with powder to be mixed up with water, and poured into molds. Once the molds were dry, you could paint the pieces and then spray them with a sealant. The boys and I loved mixing up the plaster and being careful to fill all the parts of the molds. There were instructions on the box to tap the molds a few times after filling them, to make sure all the air bubbles came out. Well, I guess we didn't tap hard enough. When we un-molded Mary, there was a huge gaping bubble hole where her mouth should be. 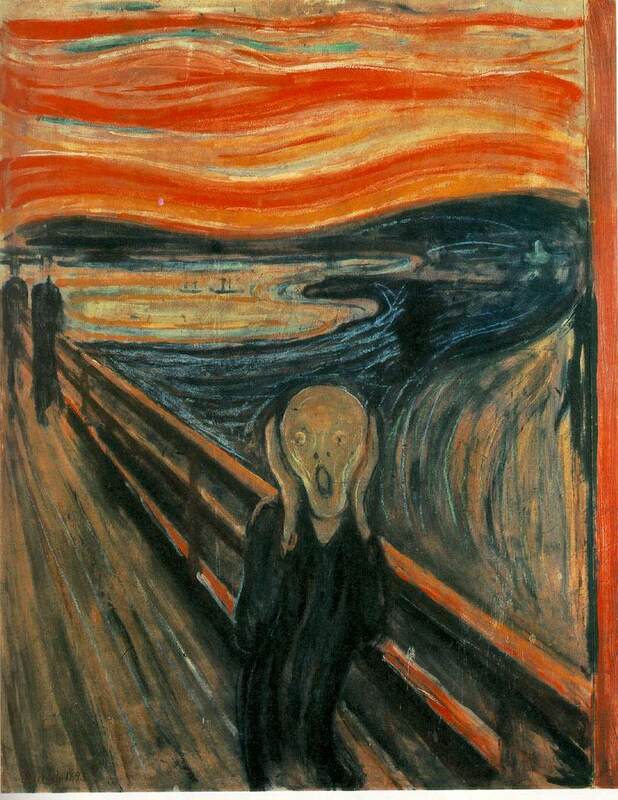 Imagine the painting by Edvard Munch - "The Scream". This is what Mary looked like. Of course, the boys got a huge kick out of this. To them, there was nothing funnier than a screaming Mary standing next to baby Jesus. Since there wasn't any more plaster mix, we had no choice but to paint her and seal her, just as we did Joseph, Jesus, the Wise Men, and the many farm animals. Every year, when we'd decorate the house for Christmas, the boys would laugh hysterically when that manger set came out of the box. I continued to set it up, until both my sons grew up and moved out. I couldn't wait to put it in the box with the other ornaments. I just knew that Chris would love it! As soon as I picked up the phone and heard his voice, I could hear the laughter in his tone. "Mom, I got the box of ornaments you sent me! It's awesome! Thank you for sending me Screaming Mary!" We both had a good laugh, and then he told me that he had already set up what's left of the manger on his mantle, so that all of his friends can appreciate our handiwork. He also hung the stuffed figures on his tree. I'm so happy that the ornaments are back on display again. Perhaps someday, he'll be sending them off to his children. I'm not sure if I'll be updating again before Christmas, so I wanted to take this opportunity to wish you all a joyful holiday season. Thank you all, for your continuing friendship, your words of encouragement, your emails, and your thoughts and prayers throughout what was a very stressful and sad year for me. You have touched my heart across the miles and the internet, and I am forever grateful. Thank you for sharing my life with me. May 2007 be a happy, healthy, and joyful year for all of us! It's the feeling of home, even if it's only a memory that takes you there. It's the quiet places of the heart you return to year after year. It's the comfort of tradition in an ever-widening circle of friends and family. Wishing you everything beautiful this holiday season! Friday, December 22nd - Happy Winter Solstice! Yesterday was a good day for those of us in Alaska. Solstice day is an important dawning of a new annual era: this is the day the sun starts coming back! For those of us who suffer from Seasonal Affective Disorder (SAD), whether in short spurts or continually, it's easy to become excited over December 21st. At least we know the darkest days are over for another year. I didn't think I was going to make another entry before Christmas, but I wanted to share some photos that I took on Wednesday night while out driving around town with Steve. First we drove to Pioneer Park (known originally as Alaskaland - and still called that by long-timers), and walked through Gold Rush Town. The cabins form a unique walk through Fairbanks' history, and I've photographed them many times over the past three years. The 1st Presbyterian Church, was the first church in Fairbanks. In 1902-03, a mission cabin was erected in the town of Chena, and was replaced with this church in September of 1904. Built on the corner of Cushman Street and 7th Avenue, the church contained the original stained glass windows from the Chena mission cabin. It had no plumbing (water was hauled in buckets from the Chena River) and, during the winter, was heated by two large wood stoves. A basement was also dug out by hand, by thawing the frozen ground with small fires. In the 1930s, the church was moved farther east on its site and turned to face 7th Avenue. It was renamed "Young Memorial Hall"; and was finally moved to Alaskaland in 1966. The lights on the houses were beautiful against the night sky. A glow settled over the street, lighting our way as we walked. In my mind I heard Christmas Carols, and even snowflakes fell from the sky. It was a lovely evening for a stroll. The Kitty Hensley house was originally located at 932-Eighth Avenue. It was rumored that Kitty and her daughter, Hazel, lived as recluses in a two room tar-paper shack on Eighth Avenue. In 1914, Kitty’s friend Capt Smythe (a retired riverboat captain with excellent carpentry skills) remodeled the cabin using lumber from his sternwheeler, which had been badly damaged by the spring’s breakup. He built this attractive two-story home, with a finely turned stairwell and a decorative fireplace. It was said that he worked slowly, in order to prolong his affectionate contact with Kitty. Some time after Kitty’s daughter grew up and left home, Kitty died -- just as much a recluse as ever. The house was moved to Alaskaland in 1967, where the Pioneers of Alaska furnished it with authentic pieces of the period. The Riverboat Nenana was built in 1933 for the Alaska Railroad. During it's 21 year active life, it hauled passengers and freight on the Yukon River in Interior Alaska. The 300 ton boat is 230 feet long and is the second largest wooden-hull vessel in existence. After laying dormant in the Chena River for several years, the old girl had enough left in her to make one final voyage. In October 1966, the proud Nenana, battered hull and all, traveled several miles, negotiating sand bars and diked channels to a resting place made for a Queen. The Sternwheeler Nenana is a precious part of Alaska's past. Extensive restoration was completed in 1992 and on July 12th of that year, she was officially dedicated as a National Historic Landmark. Her cargo hold now houses the Tanana/Yukon Rivers Historic Diorama which graphically tells the story of the riverboat's mission along the interior river system. 22 towns, villages, and settlements along her route have been recreated in incredible detail through a cross cultural, 3 dimensional display 340 feet long with an oil background mural of 237 feet. We did eventually run into another photographer while we were walking through Pioneer Park. It was definitely a good night to capture the mixture of old and new; old cabins and modern Christmas lights. After our trip through Pioneer Park, we decided to head for home. There were fireworks scheduled for later that evening, but we weren't sure where they were being held, and I was getting cold. On the way back to North Pole, I asked Steve to drive down to Golden Heart Plaza so I could see the lights along the river. It was peaceful there as well, and we had the place to ourselves. The First Family Statue stands in Golden Heart Park on First Avenue as a tribute to the many who pioneered the interior region of Alaska. We're having Christmas dinner with Rachael and James. And the four of us are having Christmas Eve breakfast at Pike's Landing - to take advantage of the scrumptious champagne brunch again. Steve and I are considering a drive to Anchorage for a few days the weekend after Christmas. If we go, it will be totally spur of the moment, and everything will just have to come together - or not. We don't expect there would be too much trouble getting a room in either Army or Air Force Base guest housing, but I have a feeling the kennel might be booked up since our soldiers are home and many families went 'home' for the holidays. I keep meaning to call. The drive is about 7.5 hours, when the weather is cooperating and the roads are clear. But at this time of year, you just never know what to expect. We'll play it by ear. I hope that you all had a wonderful holiday! Christmas Eve was very quiet at our house. Steve and I watched some movies and just relaxed. Normally, we open a gift on Christmas Eve, but since there were only a few under the tree (something we agreed upon), we decided to wait until Christmas morning to exchange gifts. Steve cooked up some ham and cheese omelets for breakfast, and made a pot of Millstone Holiday Peppermint coffee. It was absolutely scrumptious with a splash of French vanilla creamer. After exchanging gifts, we watched a movie together until it was time to get ready to go to the Trujillo's house to watch the football game and enjoy lots (too much!) food. I'm not as big a football fan as I used to be, but I do root for my Eagles when they play. I went out and did some 'day after Christmas' shopping with Rachael and found quite a few bargains. I picked up a few Christmas decor items (drastically discounted) for next year. I planned to take Steve back out the next day to look at a few bigger ticket items. As fate would have it, everything I wanted him to see was gone by then. Perhaps it was for the best. Steve drove me past Creamers Field so that I could get some photos. The sun was just starting to go down, and the moon was already up. It was a cloudy day, so there weren't any gorgeous streaks of orange or yellow. Everything was a dusky blue as daylight gradually left us. But I find the blue just as beautiful in its monochromatic glory. It lends a definite 'coolness' to the image. After we did some shopping, we went back to Pioneer Park so that I could take some more photos of Gold Rush Town. A friend of mine wanted to purchase an 11x14 print of the log cabins and lights to hang up in her house during the holidays. The photos I posted in the previous post were OK for web posting, but they were shot without a tripod, and a little too soft for my liking (especially for enlargements). What a difference using the tripod made! I was able to open the shutter for a much longer exposure, capturing a lot more light and color. The moon in the sky was a nice added touch too. The photo at left has had no retouching at all. This is exactly the way it came off of my camera. The long shutter speed and overexposure captured every bit of light in the scene - to include the backlighting and front lighting of the trees behind the cabins. It looks like a movie set with a painted backdrop to me. Very surreal! On the way back to the house, we drove past a home with a huge tree in the front yard. The owners had strung lights all the way up and down the tree. He must have had a cherry picker at his disposal, because that tree was tall! He used red and blue lights, which combined to cast a purple glow on the snow covered boughs. Just lovely! I just had to take a photo. We're having Rachael and James over for dinner on New Years Eve. It will be my first "dinner party" here in the new house, and I'm excited about 'christening' the dining room. I'm making a roast with vegetables for dinner, and picked up some appetizers to enjoy while we're playing some games and watching the New Years Eve festivities on TV. My goal is to make them feel as fat and bloated as they made us feel on Christmas Day! I'll be glad when the holidays are over and I can attempt to go back to sensible eating. You probably won't hear from me again until after 2007 is upon us. May you bring in the new year surrounded by those you love the most! Happy New Year, everyone! by your contribution to the fund of general enjoyment."